Word Clouds by ABCYa is an excellent free iPad app that I just found out about from Free Technology 4 Teachers. This is a great app similar to Wordle or Tag Cloud for creating those ever popular word clouds. Word clouds are often used to visual represent a word frequency and can be used by any subject or curriculum. This app is very easy to use and allows a user to edit their clouds by font color, size, etc. I highly recommend checking out Word Clouds by ABCYa by clicking here!!! 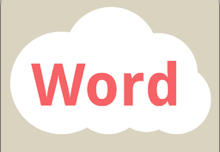 For my Pinterest board on Word/Tag Clouds click here.